25 Years of Service. Site Safe. Our professionally trained staff can offer video and photo surveys, water leak detection and repair works. We offer repair options and quotations to carry out these works. 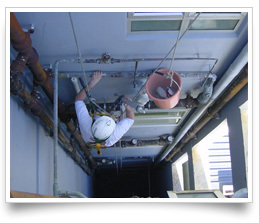 We also offer general maintenance and resealing of buildings aided by the use of Industrial Abseiling, including access of tanks and restricted access areas. Concrete Doctors Ltd – The Concrete Doctors® – Leaders and Innovators in their field of expertise.